“You unlock this door with the key of imagination. Beyond it is another dimension. A dimension of sound. A dimension of sight. A dimension of mind. You’re moving into a land of both style and substance, of things and ideas. You’ve just crossed over into the Twilight Zone.” These familiar words from Rod Serling, for me at least, bring back nostalgic memories of watching The Twilight Zone with my dad and riding the Tower of Terror with my entire family (we even tricked my mom into riding it once by saying that it was "a walk in the park”). I was too scared to watch The Twilight Zone until a couple years ago, and I was too nervous to ride the Tower of Terror until my younger sister was tall enough to ride it with me. Although, I’ve always been an extreme scaredy cat (I’ve still never seen The Wizard of Oz because I’ve been warned of the flying monkeys), the Tower of Terror has been an attraction that I’ve almost always looked forward to riding. It was the last day of my family’s California vacation last summer when Disney announced that The Twilight Zone Tower of Terror would be remodeled in 2017 into Guardian’s of the Galaxy Mission: Breakout. Needless to say, I was pretty moody the rest of that day. The life of the Tower of Terror at Disneyland is quickly coming to a close, and before it goes, allow me to enlighten you on the history of this timeless attraction. The Tower of Terror debuted at Disney’s MGM Studios (now Hollywood Studios) in 1994. It was brought to California Adventure ten years later in 2004 after the success of the attraction in Hollywood Studios. Today, the attraction also resides in Tokyo DisneySea and Walt Disney Studios Park in Paris. Imagineers (a Disney term that combines the words “imagine” and “engineer”) at Disney were inspired by Rod Serling’s, The Twilight Zone, to create a unique thrilling attraction. The Twilight Zone was a popular television series from 1959-1964. The series was unique in the fact that every episode was a completely different storyline that took the characters on a journey to the fifth dimension. Although there was a different cast for every episode, they all had one thing in common, each episode taught the viewers an important lesson (at least that’s what my dad always says). For instance, “Time Enough at Last” taught viewers that time is useless unless you have someone to share that time with; “To Serve Man” taught viewers that even though someone might make a really appealing pitch, you can’t trust anyone; and “Number 12 Looks Like You” taught viewers that uniqueness makes life interesting. There’s no other show like The Twilight Zone that really made viewers think critically. Watch one of the episodes, and you’ll see what I’m talking about. The idea of the Tower of Terror was to put guests in an episode of The Twilight Zone where you are the star. So, Disney created the Hollywood Tower Hotel, a hotel where everyone who was anyone congregated in the 1920s and 30s. On Halloween night 1939, a time where movies like Weathering Heights and Gone with the Wind were playing in theaters, the biggest movie stars of the time were celebrating at the Hollywood Tower Hotel. Four guests and the bellman walked into the elevator that stormy night. These guests were taken up to the thirteenth floor, “which is strange for a hotel that only had twelve floors”. At that moment, lightning struck the elevator, sending the five passengers plunging to the fifth dimension. An entire wing of the hotel vanished along with the five passengers. From that day on, the Hollywood Tower Hotel has been preserved as it had been that day long ago in 1939. Empty Champaign glasses and a lipstick stained napkin helplessly lay on one of the tables, a dust and cobweb infested porcelain doll sits lifeless on the dusty couch, and weathered leather luggage resides on the floor next to the check-in desk where a room key remains untouched on the counter. And so, Disney imaginers went to work building this 199 foot hotel. The imaginers were faced with the challenge of making a completely new building look 65 years old. They weathered the outside of the hotel to look spooky with chipped paint and overgrown vegetation, and they transformed the inside of the hotel to look mysterious with cobwebs and dust, giving the feeling that life at the hotel suddenly halted that night in 1939. Fans of The Twilight Zone will notice that nods to the television series are scattered throughout the hotel. A broken pair of glasses sits atop a row of books in the boiler room, a book titled “To Serve Man” sits on an upholstered chair in the lobby, and a sign near the exit of the ride proudly reads “Willoughby Travel”. Read this article to see the full list of references to The Twilight Zone scattered throughout the attraction. Before the attraction checks out for good, if you live in the Anaheim area, do me a favor and ride the Tower of Terror for me (sadly, I won’t get the chance to ride this attraction one last time before it’s retired from DCA). The famous Silver Lake Sisters now serenade guests riding the attraction during late checkout at dusk, giving the attraction an even more authentic feel. 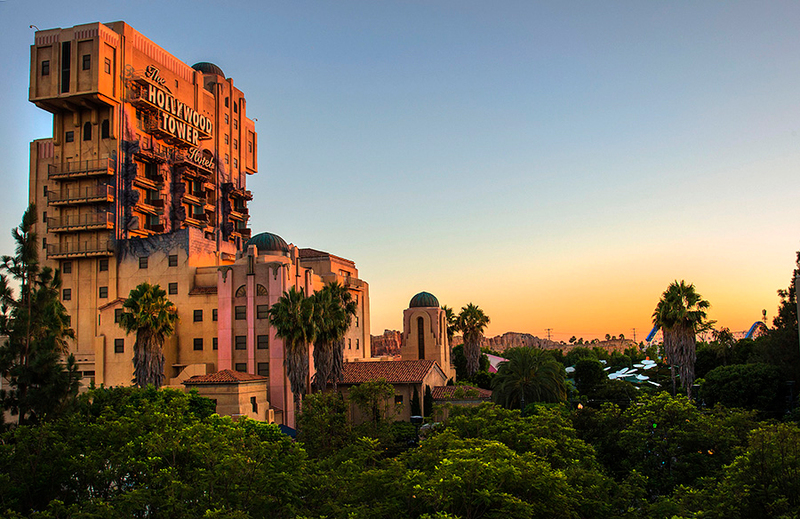 If you really want to experience the Tower of Terror to its fullest, attend The Twilight Zone Tower of Terror – 13th Hour Party. After the park closes on January 1st, guests will get the chance to ride the attraction for three straight hours while taking part in the dessert buffet. There will be photo opportunities and keepsakes available for purchase. Of course this event comes with a price, but those guests will be the last to rid the attraction as January 1st is the last day the attraction will be in operation before transforming into Guardian’s of the Galaxy Mission: Breakout. If you’re finding it hard to live with this news (like I am), check out this video by FreshBakedDisney. They do a great job of explaining why this change is happening to DCA. If you want to learn more about the history of The Tower of Terror, watch this video staring Kirk Cameron (beware, watching this video might make you love the attraction even more and make it even harder to watch it leave DCA, as it did for me). And, if you’re feeling like you need a little more Tower of Terror in your life, listen to the attraction music loop. I’ve listened to this loop more times than I could count, just to make me feel like I’m walking through the ominous lobby, waiting to board the attraction one las time. I know this is a hard time for all of you Twilight Zone lovers out there (me included), but let us trust in Disney that they have our best interest (I’m trying to be optimistic here). Although the tower is checking out, it will never be forgotten. When I was little, I hated the attraction because it scared the living crap out of me. But as I’ve grown up, and after watching some of the Twilight Zone episodes, I realize the importance of the ride and the legacy that Rod Serling left in many of the Disney parks today. California Adventure won’t be the same without the Tower of Terror.